Had a wonderful trip with Jose and crew. Our seven year old got to steer the boat on the way back after watching the whales and swimming by the caves. Plenty of snacks and drinks and when the kids were tired, no problem going below deck to relax out of the sun. It was our second trip and we‘ll do it next year again and again and again... love it. We‘ve seen lots of doplphins and pilotwhales. Fantastic trip, well worth the money - such a peaceful and intimate way to see these amazing creatures in their natural habitat without disturbing them. Our hosts were fantastic! We had a wonderful time. My 7 years old twins got to see whale and dolphins swimming past our yacht. The owner written to us during the booking that the cruise port was approximately an hour drive away, they offered to arrange transportation for us at additional cost if we wish to proceed. The transportation was punctual and we had a great time, thank you! Fantastic trip, only a small Yacht, so no bigs groups pushing past you trying to find a gap to take a photo ! We saw dolphins, whales and a turtle. Captain was great and she was very knowledgeable. We will book this again when we return. Brilliant! We were lucky enough to have the boat to ourselves (just me and my partner) and also very lucky to see a whale family and lots of dolphins that weren't from this area so also just tourists. Brilliant experience and the tour guide was so friendly and took a genuine interest in us seeing as much as we could. amazing and unparalleled experience, thank you! seeing dophins that close was just spectacular! I was really looking forward to this trip as it was a surprise for my partner for his birthday. We also invited two of our english friends to join us. To say i was disappointed was an understatement. 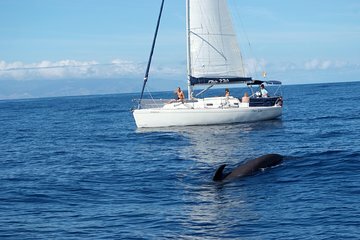 Firstly, when I booked the tour, it stated that there would be unlimited drinks and fresh sandwiches on board, information about the marine life from your captain, viewing the whales, head to a secluded bay where you'll drop anchor so you can swim off the back of the yacht. Use of the provided snorkeling gear to look for turtles. More sandwiches and drinks will be served before pulling up the anchor and sailing back to the marina. We saw 7 whales and no dolphins, that was fine as it was nature. Secondly,the anchor was dropped but miles away from the bay, we were not offered snorkeling gear. The sea looked very black were we were anchored. There was not unlimited drinks and food aboard as stated on this website. We got two small cans of cheap beer each and a rock hard baguette with rubber ham and awful cheese. When asked the captain on board if there was any more available, he shouted up to us NO. We were very embarrassed, especially as I had informed them that it was my partner's birthday and we had guests on board too. When we arrived back, we told the lady who had picked us up from the hotel what had happened and she basically said that it was his first day and she would talk to him. An excuse. Once they got paid, they didnt care. When talking to different people back at the hotel, they booked this trip down the town for 40 as opposed to the 55 each we paid. They had as much cava, wine, beer and snacks as they wanted and they were offered snorkling gear. I wont be booking with Viator anymore and will do it locally on holidays.